Below shows more details and close-ups of the carbon targets WPP aim to achieve as well as environmental issues they are also driven by, along with their clients. These facts allow a more insightful view of their stringent targets and estimations they work hard to achieve through their previous campaigns which have been executed. These sustainability topics below will help the idea and content process of this brief even more so along with the reports from WPP. Climate change is the main environmental issue for WPP. In addition to the environmental benefits, reducing our carbon footprint helps us to reduce costs, as well as recruit and retain environmentally-aware talent. Our climate change strategy helps us win work with business and public sector clients looking for suppliers with solid environmental credentials. Taking action to shrink our own carbon footprint enhances our credibility as marketing and communications advisors on climate change. Offsetting a portion of our unavoidable carbon emissions, equivalent to those from business air travel. Our target is to reduce carbon emissions per person to 1.2 tonnes by 2020, a 65% reduction on our 2006 baseline (3.39 tonnes of CO2). We have set interim targets for 2012 and 2015 to track progress. *Figures shown above are based on rating renewable energy purchased as zero carbon.We believe a carbon intensity target is most appropriate for WPP, as Group headcount is closely linked to levels of business activity. Our business evolves continually through acquisitions and disposals. The intensity measure allows us to reflect this without needing to adjust our baseline. These are measures that IT, procurement and real estate managers across the Group are implementing to bring carbon savings at no or little capital cost. These measures range from simple actions, such as ensuring that lights are switched off, to more complex measures like targeting high-energy-use areas in the office. In order to track progress a climate checklist is distributed to all WPP offices worldwide. We aim to empower our operating companies with better information and tools for managing their carbon emissions. For instance, we produce an individual carbon footprint report for every company annually, which is distributed to the operating company CEO. We are tackling our carbon footprint with a range of initiatives that span travel and energy consumption. Since 2006, we have offset a large proportion of our unavoidable carbon emissions by investing in renewable energy projects. From 2010, we decided to only offset emissions from our business air travel, so that we can focus our investment on improving energy efficiency. 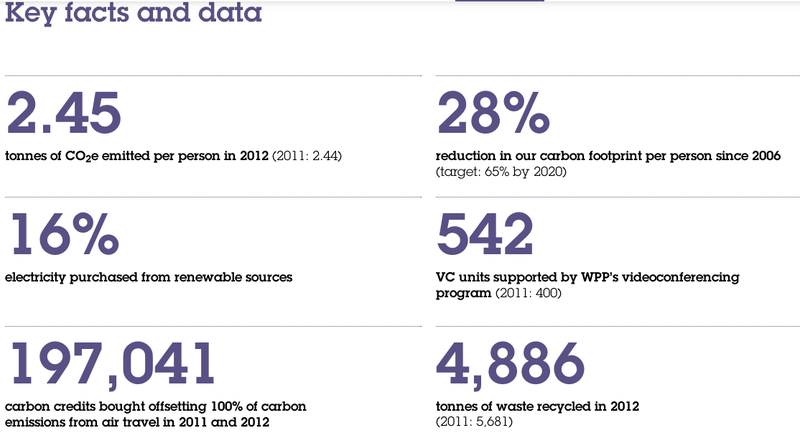 For more details on carbon offsetting at WPP, read about the projects that we are supporting here. *figures shown above are based on rating renewable energy purchased as zero carbon. **includes unmeasured impacts such as couriers and taxis. Since 2006, we have offset a large proportion of our unavoidable carbon emissions by investing in renewable energy projects. This means paying someone else to reduce their emissions by a specified amount. From 2010, we decided to only offset emissions from our business air travel, so that we focus our investment on improving energy efficiency. How offsetting worksGovernments, international institutions and private companies have devised a trading system to enable organizations to pay for emission reductions elsewhere. Using this system, companies can buy carbon credits to offset some of their unavoidable emissions. For example, a village in India uses kerosene for light and cooking. Villagers would really benefit from electricity but they are miles away from the grid and they can't afford solar panels. A specialist offset agency pays for the panels and creates credits for the amount of CO2 saved by avoiding the use of kerosene. One credit equals one tonne of CO2 avoided. The agency then sells the credit which is used to offset emissions. In 2011, we appointed a new provider, South Pole Carbon Asset Management, to offset our emissions from air travel from 2011 to 2013. During that period, our operating companies will cover the cost of offset equivalent to their annual air travel emissions. This will incentivise our companies to reduce air travel. Named 'Best Project Developer' in 2011 Voluntary Carbon Market Survey published by Environmental Finance, South Pole has projects in 20 countries which work to reduce greenhouse gas emissions while benefitting local communities and the environment. WPP is supporting four renewable energy projects in China, New Caledonia, Taiwan and Turkey. * From 2010, we decided to only offset emissions from our business air travel, so that we focus our investment on improving energy efficiency. Business air travel accounted for almost 35% of our total carbon footprint in 2012 - at about 96,000 tonnes of CO2. This makes it the second largest contributor to our carbon footprint. Business air travel is a necessary part of the way we work. Much of what we do as a business is face-to-face and international nature. These personal relationships, especially with clients, are important to our success. However, we recognise that extensive air travel has an undeniable impact on the environment and may affect the well-being of our people. Striking the right balance as our business grows is important but challenging. We aim to reduce non-essential flights - especially between our own offices - by encouraging both internal and client-facing teams to make better use of videoconferencing and other collaboration tools. Conference production services to assist operating companies with the production of complex and/or critical videoconferencing calls involving multiple systems, users and content types. As an office-based company, our resource use and waste generation are relatively low. However, we spend over $9 billion with suppliers of goods and services each year, related to both our own business as well as the work we do for clients. So using fewer resources and producing less waste are clearly an opportunity to reduce costs, both for ourselves and for our clients. Use natural resources as efficiently as possible by reducing unnecessary consumption wherever feasible. Promote the use of sustainable and renewable resources by encouraging our operating companies to use preferred suppliers selected by WPP across key areas of spend. Reduce the amount of waste we send to landfill by encouraging local arrangements for computer and furniture re-use and establishing recycling contracts for electronic waste and standard office consumables. In 2012, 31% of the paper we used for copying and printing contained at least 50% post-consumer recycled fiber. Our target is to increase that percentage to 50% by 2015. We have established preferred suppliers of recycled paper in our major markets, which our operating companies are encouraged to use. Our managed print program helps us to reduce paper use by 20 to 30% per location. In 2009, we launched a water conservation strategy that targets our largest locations in areas of waster scarcity. At 11 key locations, we are measuring our water consumption and establishing pilot projects for water conservation. Our target is to reduce water use per person by 20% by 2015 to 11.7 cubic meters. Our water conservation guidelines help our operating companies to reduce water use. We will use what we learn at these locations to inform how we manage water in other offices located in areas of water scarcity. Office waste:We have established preferred suppliers of recycling services for waste paper and standard office consumables in our major markets, which our operating companies are encouraged to use. IT waste:Our goal is for obsolete IT equipment to be refurnished and sold for reuse or, if this is not possible, to be broken down for recycling. Disposal is a last resort and must be done in compliance with local environmental regulations and data security best practice. We appointed global IT vendors to manage our obsolete IT equipment, including laptops, desktops and servers in 2012. We use mobile technology extensively and handsets are frequently upgraded. We have established preferred suppliers of recycling services for mobile phones in our major markets, which our operating companies are encouraged to use.